Last night was almost a complete disaster, friends. But then there was a miracle. A Halloween miracle! We made a movie about it. 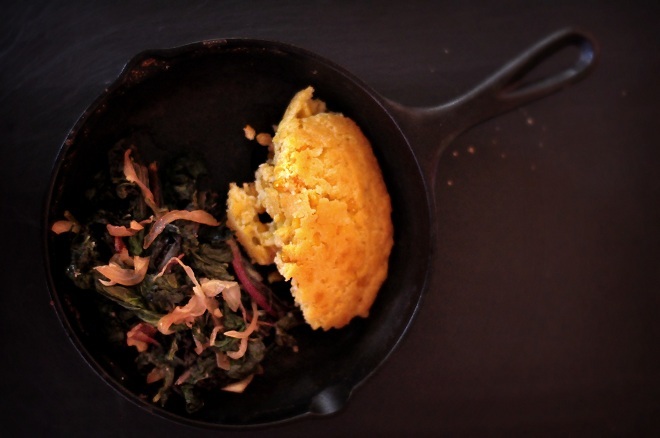 Tonight’s dinner is creamy corn pudding with savory glazed greens (kale and chard). The corn pudding takes less than 5 minutes to prepare (plus 45 minutes in the oven) and out comes a creamy, fluffy, cornbread-like casserole that’s to die for. The original recipe is from Scott’s mom. The greens we adapted from a recipe one of you sent me last year from Austin, Texas (thanks Adam)! We’ve made it 20 times since then. The honey erases any bitterness in the kale or the chard. It’s a great way to eat winter greens. Preheat the oven to 350 degrees. Butter a 9 x 9″ baking dish, or several individual ramekins, or a 10″ oven-proof skillet. Mix all ingredients in a large bowl and pour into the prepared dish(es). Bake for about 45 minutes (less for small ramekins), until the top is golden brown. Serve. If you’re using chard, rinse the leaves and remove any tough stems at the bottom of the leaf (but you don’t have to remove the fibrous part running up each leaf). Rip the leaves into a few pieces. If you’re using conventional kale from the grocery store, you should parboil it first because it’s a bit tougher. To do this, bring a large pot of salted water to a boil. While it’s heating up, rinse the kale. Remove and discard the long stem running up the leaf. Rip each leaf into a few pieces. Boil the kale for two minutes or so, until it’s bright green and just a little tender. Pour the kale into a colander and run it under cold water. Drain it and wring it out with your hands. If you’re using fresh kale (such as from a farmer’s market) whose ends look like normal leaves rather than the ripply fronds you see on conventional kale from the grocery store, you don’t have to parboil it first because it’s not tough. Just rinse it and rip the leafy parts off the stem. Discard the stem and rip the leaves into a few pieces. In a large (preferably deep) skillet, cook the bacon over medium heat until it’s crispy and has rendered its fat. Remove the bacon with a slotted spoon and set aside. You should have about 1 Tbsp. of bacon fat in the skillet. If not, that’s fine–just make sure to add a little olive oil if, as you proceed, the vegetables dry out. Add the onions to the skillet and sauté over medium-low heat for a few minutes until the onions have softened a little and are translucent. Don’t brown them, though. Add the garlic and cook for another minute. Pat the chard or the kale dry and add it to the skillet along with the wine (or broth, as you prefer), honey and red pepper flakes (if using). Cook over medium heat, stirring occasionally, until the greens have wilted and become tender. Add the butter cook another few minutes, until most of the cooking liquid has disappeared. Taste and season with salt and pepper if desired. If your greens are at all bitter, add a tiny bit more honey. Throw the bacon pieces back in there if you like. Serve. 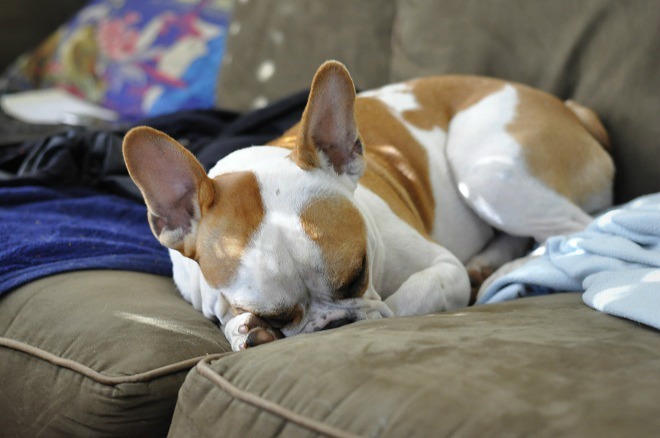 When Halloween disappointed Thunder, she burrowed her face into the cushions and took a nap. I love miracles!!! And you gave me one…thank you!!! Vern, I would have been so embarrassed to feed your wife ravioli on a bed of lumpy, congealed chicken BUT she and Dave were so kind and friendly and fun to be around, that I figured “what the heck. The company’s more important than the food.” I had such a wonderful time that night. I do hope you can come next time! I had a moment last night, about 1.5 glasses of wine and 0 trick-or-treaters into it, when I thought I might be asleep on the couch cuddling a basket of candy before anyone came. But luckily, they started arriving before I tipped (tippled?) over. Glad you had a happy ending! Awwww! He was an adorable little police man! And is white wine and skittles problematic as a dinner menu? I mean, I prefer (and occasionally have) red wine and chocolate, but it seems like a good combo either way. A, skittles and white wine is indeed a respectable menu, I agree. Except there were far too few RED skittles in the packages. And red skittles–much like red wine–are delicious. Awww – your video is kind of poignant! That music is perfect. I got a little teary-eyed (no joke) when your trick or treater showed up. Of course, I’m about three glasses into a bottle of wine myself at the moment, lol! Also, that kid is SMART. Did you see the way he was multi-tasking – eating a sucker with one hand and grabbing candy with the other? Brilliant!!!!! Wendy, when he took the stairs one at a time (like, both foot on the same stair, so he wouldn’t fall over) I almost cried myself. Could not have been cuter. Afterward, his dad said “say thank you!” and he turned around and gave me the tiniest, most whispered “thank you” I have ever heard. It was precious. Great Post and Hope Thunder is having a better day today! Have a Great One! Hee hee. Thunder has recovered from her whining and is happily chomping on a tennis ball (inside the house, no less! Usually not allowed, since she rolls it under the furniture and barks at it all day) so she’s having a blast! Have a great weekend! Awwww. Cute trick-or-treater. The corn pudding and greens look delicious, too. The corn pudding is sooo easy! And I have to tell you something, kale chronicles: I cooked too much of your namesake last week, as part of an experiment in making Thanksgiving stuffing. Unfortunately, the stuffings didn’t turn out well, and I dumped a fair bit of sausage and kale stuffing down the garbage disposal. Turns out that kale can get majorly stuck in there, and our garbage disposal stopped working. It cost a HUNDRED AND EIGHTY dollars to fix yesterday. Can you believe that?! Nothing makes a holiday bright like a miracle! Thanks for sharing yours. It was a bit raw around here last night (40 degrees and misting) so I decided to add a splash of bourbon to the travel mug of hot mulled cider I took out onto the porch while I waited — it was the best time I’ve EVER had handing out candy. I bet that cider was a boatload of fun, Jennifer. I haven’t had hot mulled cider in a while, but a long time ago I was at a Christmas market in Germany and it was FREEZING. Absolutely freezing. People were selling hot spiced wine, and we kept drinking them because it was the only thing keeping us warm. I hadn’t had it before, though, so I didn’t know how strong they were. Also, we were pretty much numb anyway, so we couldn’t tell how hard each styrofoam cup was hitting us. When we finally sat down at an indoor cafe and thawed a little, I almost fell off the chair. Haha, that video is amazing 🙂 So you only got ONE trick-or-treater?? So very sad. We missed halloween completely since we were on our honeymoon…I can’t wait til we have a house and hopefully we’ll get more than one kid stopping by. Dennis just walked in on me watching the video and he was so excited. He said “Did Scotty and Kat have a kid?! ?” Glad you got a trick or treater. I’m excited to try the greens with honey. Awwww. . . I love that. If we ever have a kid, Dennis and Calvin will have to be its mentors so that it grows up to be the coolest kid ever. I’m noticing a trend here of disappointed hosts, wine and a lack of trick-or-treaters. The fad here is to do “Trunk or Treat” where families go to a parking lot and dispense candy from their car trunks. The little goblins march around in their costumes and load up in a safe, family-centered environment. Granted, it’s not as cool or scary as going door to door, but it might be less disappointing and cause fewer headaches in the morning. And think how much fun Thunder would have guarding the trunk. That’s great! Love the videos. It seems kids don’t do Halloween, like when we were growing up. I think they go to malls and other such places for safety these days, to do their trick or treating. That kid is a herooo!!! Loved it. The music accompanying the arrival of that gangsta trick-or-treater was dope. Had me rolling. Awww! Just the one? My hubby decided there was drinking game, one drink per kid. That went downhill fast when a group of 11 hit us! We got 40 this year – pretty impressive in a town of 1,500 in a country that doesn’t ‘do’ trick-or-treat! We try really hard to get them here, the ONLY TIME we want kids anywhere near us. Best part of that video was the AWESOME alien pumpkin. We have lived in a neighborhood where we had over 100 trick-or-treaters. Now we live in a neighborhood where we’ve had a grand total of zero in the last 3 years. But that just means we can snuggle on the couch, watch “scary” movies, and eat our weight in unclaimed Halloween candy. that’s a new record for when i begin giggling during one your videos. this particular fit of laughter started the moment i realized the song choice was “let my love open the door.” BRILLIANT musical pairing. also, i’m a huge sucker for a corn pudding, so i’m giving scott’s mom’s a try. I’ve been making kale like this for a week or so now, and pairing it with roasted cauliflower, but it could use a big fat side of corn pudding instead.